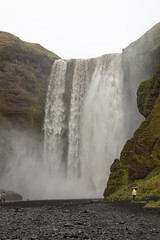 One of our first stops heading west from Klaustur was Skógafoss. Skógafoss is one of South Iceland’s most impressive waterfalls, about 75 feet wide and 200 feet tall, with a large enough water volume that it generates a fair amount of wind and mist. Like most of the major waterfalls, it also has it’s own legend. No, not trolls this time, but Vikings, apparently one early Viking settler, Þrasi Þórólfsson, hid a chest of gold under the falls that was never found except for a large ring from the side of the chest, which apparently is now part of an elaborate door-knocker on the local church. However, supposedly more than a few people over the centuries have had various misadventures trying to find the treasure. If it’s not those troublesome trolls, it’s the Vikings, I guess. 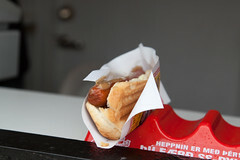 Oh, and Skógafoss also sports a hot dog truck. The Skógafoss Country Wagon can generally be found in the main parking lot of Skógafoss, near the campsites and the laundry area for hikers. Like Pylsukoffin back at Krafla, Skógafoss Country Wagon seems primarily there as a source of cheap eats for the local hikers and the occasional tourist. The menu was simple (meat soup, fish soup, and hot dogs being the three major items), but since we were a bit hungry, I decided that yet another exemplar of the Icelandic Hot Dog was in order. Basically, this was the same hot dog I’d get most places: a good Icelandic lamb hot dog (indeed, the very same hot dogs from SS Pylsur severed at most places, including Bæjarins Beztu Pylsur), served up with the full raft of condiments (fried onions, raw onions, ketchup, sweet mustard, and remoulade). Here the twist was that Skógafoss Country Wagon also has a panini press, so they warm up and gently toast the bun first. Was it earthshaking? 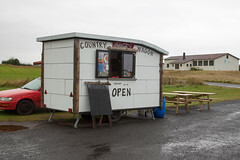 No, but Skógafoss Country Wagon was one of the best food options for that entire stretch of the Icelandic coast. And a pleasant treat while hiking and driving.